NB. The Laptop is sitting on a boat in Port of Shanghai, China. . .so, here's a Roman homily from 2009. Christianity is the “one great curse, the one great inmost corruption...the one immortal blemish of mankind” (Hovey 3). Thus spake Friedrich Nietzsche, the philosopher-prophet of the anti-Christ. British theologian, Craig Hovey, notes that Nietzsche “loathed Christianity, especially Christian morality. He thought Christians were irrational, self-deceived, repressed, and arrogant; he took Christian morality to be pettily reactionary and positively fatal to life…”(3). Will the Prosecutor of the Church in his closing argument before the judge of the world rest his case and demand a guilty verdict? Do we stand convicted by the evidence of human history—the thoughts, words, and deeds of our own hearts and minds? Are we guilty? We can point to the hospitals and orphanages we have built. Our Prosecutor can point to the injuries we have caused and the orphans we have made. We can point to the spread of the Gospel in the New World, the souls we brought to Christ. Our Prosecutor can show the jury our destruction of whole cultures in the pursuit of gold and slaves, all the souls we lost to our greed. We can point to our tireless efforts to relieve poverty, hunger, and suffering. Our Prosecutor can bring evidence of the poverty, hunger, and suffering we have caused. Are we guilty? Before the judge of the world and a jury of our peers, how do we plea? What is our defense? Is the Church “irrational, self-deceived, repressed, and arrogant”? Are we “pettily reactionary and positively fatal to life”? We can be. This is not who we are fundamentally. But we could plead guilty to the charges w/o perjuring ourselves. At our worst, we are worse than the unbelievers and those who would persecute us. At our best, we are Christ for the world. The Good News is that we never again have to be anything or anyone less than Christ. Never again are we compelled by irrational instinct or inordinate passion or selfish greed to commit a single sin, not one crime against God, our world, or one another. We are free. Free from all that would acquit us on the grounds of insanity; free from all that would excuse our crimes as animalistic and primitive. We are free to love, to show mercy, to build tighter and tighter bonds of friendship. We are free because we have been freed by the mercy of the One Who sits in judgment. No, Sister, the nature of authority and obedience hasn't changed since Vatican II. . .
Pope Francis has begun his assault against the secularization of religious life, attacking the late-20th century tendency to separate religious commitment from the Church in order to serve the spirit of the world. We have seen this tendency in the shift to purely secular service among women religious, accompanied by New Age spirituality and feminist careerism. Although Pope Paul VI, Pope John Paul II, and Pope Benedict XVI all attempted to foster a spirit of true renewal in communities of consecrated life around the world, progress among the badly infected orders has been like the proverbial pulling of teeth—with excuses for delay and, if delay fails, then kicking and screaming. The latest evidence of the widespread rebellion against the Church was found in the effort of Sister Mary Lou Wirtz, President of the International Union of Superiors General, to derail the reform of the Leadership Conference for Women Religious last Tuesday. Sister Mary Lou claimed that the nature of authority and obedience had changed since Vatican II, that the LCWR wanted to focus on what “Gospel leadership” means today, and that the Vatican was clearly not interested in that topic. But Pope Francis cannot be fooled in this. He has experienced the rot in religious life first-hand; he was marginalized by his Jesuit Superiors as a young priest, just as true men and women of the Church in so many religious orders have been for the past two generations [. . .] Will he shift from words to discipline? We don’t know yet, but it has not taken him long to respond to Sister Mary Lou or to go on the offensive verbally in a tone which sounds suspiciously like he is ready to lay down the law. The Pope received the plenary assembly of the International Union of Superiors General in audience the day after its president gave her ill-conceived interview to Vatican Radio. The complete text is available under a striking title, Careerists and Climbers Doing “Great Harm” to the Church. Francis struck at the very heart of the religious malaise today, while responding pointedly to the leader of the IUSG. . . This Just In. . .The Pope is Still Catholic. . . Finally, the ecclesial aspect as one of the constitutive dimensions of the consecrated life, a dimension which must be constantly recovered and deepened in life. Your vocation is a fundamental charism through the journey of the Church, and it is not possible that a consecrated woman or man do not “think” with the Church, which gave birth to us in Baptism; a “thinking” with the Church which finds its filial expression in fidelity to the Magisterium, in communion with the Shepherds and the Successor of Peter, Bishop of Rome, visible sign of unity. The announcement of and the witness to the Gospel, for every Christian, is never an isolated act. This is important, the announcing of and the witnessing to the Gospel for every Christian is never an isolated act or that of a group, and no evangelizer whosoever acts, as Paul VI recalled so well, “under the force of his own inspiration, but in union with the mission of the Church and in her name”. Paul VI continued: “It is an absurd dichotomy to think to live outside the Church, to love Jesus without living the Church. Feel strongly the responsibility that you have to care for the formation of your Institutes in the sound doctrine of the Church, in the love of the Church and in the ecclesial spirit. I wrote to TOSHIBA Customer Service to ask if there's anything I could do to speed delivery of my laptop. Their response: "Sorry. Your system is shipping from China." Good writers hate clichés, or they should. Clichés don't tell us anything new or interesting. But they do have their uses. For example, in polite conversation, clichés free us from potential embarrassment in social situations. Let's call these “formal noises.” A phrase like, “Hey, how you doing?” Phrases and words that we hear so often that we no longer hear them as requiring anything of us other than that we play the game and politely utter another formal noise. We can find examples of formal noises in scripture. We’ve heard them a thousand thousand times. Clichés in polite conversation are one thing, however, allowing scriptural language to become cliché, allowing the words of the Word to become dull with use or to utter biblical language like a formal noise is dangerous. We have an example this morning. Let’s see if we can reclaim a clichéd phrase and restore it to its proper luster! Lydia, a dealer in purple cloth, is attending to one of Paul’s homilies. Scripture tells us, “[She] listened, and the Lord opened her heart to pay attention to what Paul was saying.” How many times in your life as a Catholic have you heard someone use the phrase “open our hearts”? Don’t you hear this phrase as white noise? Just formal speech, meaningless filler? We pray all the time: “Lord, open our hearts and minds …” And we do this very casually, very matter-of-factly. When, in fact, this is an incredibly dangerous thing to say! How much more so to pray it! But the habit of repetition, the pattern of sound and occasion has dulled the sting of the fire in these words and so we mouth them too easily and expect little to happen b/c we did so. Let’s take a moment to look a little closer at what the heart is for us as believers. In the Catechism we read, “The heart is the dwelling-place where I am, where I live…the heart is the place ‘to which I withdraw.’ The heart is our hidden center, beyond the grasp of our reason and of others…The heart is the place of decision, deeper than our psychic drives. It is the place of truth, where we choose life or death. It is the place of encounter, because as the image of God we live in relation : it is the place of covenant” (CCC 2563). For us then our heart is that place where who we are most fundamentally rests. To open this place and offer it to another is an awesome, perhaps fearful task. And because we are no one unless we are in a relationship, in a covenant, we are defined essentially by the one who rests in our heart…whoever He or It may be. Lydia’s heart is opened by the Holy Spirit, the spirit of truth promised by Christ as he says farewell to his disciples: “When Advocate comes whom I will send you from the Father…he will testify to me.” Paul testifies. Lydia listens. Her heart is opened. And the Spirit of Truth seizes her. She and her household are baptized. This is very dangerous. Dangerous? Yes. Jesus goes on to tell the disciples that b/c they have listened to his Word, received the Spirit of Truth from his Father by his agency, that their hearts will be opened. This is a good thing? Yes and no. As a result of this gift they will be expelled from the synagogues and killed as act of worship by those who have not listened to Word, have not received the Spirit of Truth, by those whose hearts—perhaps wisely in this case—remain closed. As a prayer, “Lord, open our hearts,” means “Lord, let us be killed for knowing Your Truth.” Will we be so quick to mumble this religious cliché in the future? I hope so. But we should do so remembering what Jesus tells his disciples: “…the Spirit of Truth [I send you from the Father]…he will testify to me. And you also testify, because you have been with me from the beginning.” Even as we pray to be killed for knowing his truth, we remember: Christ is with us, then, now, always. Peace: one more thing Jesus messes up! NB. Another adapted homily. . . There is nowhere to run, nowhere to hide. You are no longer our own; you no longer live for yourself alone. So, you can stop running and hiding. You are possessed by a spirit! Wholly owned and operated by the Holy Spirit. And if this causes you noticeable delight—Good!—but let me add a dire warning that will likely creep you out: you have, we have in virtue of our possession by the Holy Spirit, we have inherited (are you ready? )…the Peace of Christ! If this doesn’t give you the heebie-jeebies, you weren’t listening to the gospel. Jesus says to the disciples: “Peace I leave with you; my peace I give to you.” Easy enough. Then, he adds: “Not as the world gives do I give it to you.” Now that’s just wrong! He had a good thing going there and then he messes it up by telling us that this Good Thing he’s giving us isn’t exactly the Good Thing we thought it was. And that changes everything. Except this: there is nowhere to run, nowhere to hide. We are no longer our own. You would think that as heirs to the peace of Christ, we would be rejoicing in his serene calm, a well-balanced spiritual harmony. You would think that we would never argue, never fight, never become angry or frustrated with one another. You would think. And you would be wrong. Why would we assume that Christ’s Peace has anything at all to do with spiritual serenity or psychological wellness or bodily stillness? Given Jesus’ tumultuous life and his violent end on the cross; the oftentimes violent history of the Church on earth; given the sometimes painful, purifying work of the Spirit’s Fire in us and among us; and the ebb and flow of pilgrims' holiness, why would any Christian believe that Christ’s Peace is about peace at all? Shalom I leave with you; my shalom I give to you. Inasmuch as “love” has come to mean “that warm-fuzzy feeling we get that tells us to accept and approve anything and everything that comes our way,” so “peace” has come to mean something like “a permanent numbness of heart and mind that deflects all conflict at the expense of the truth.” Biblically, of course, peace (shalom) means “prosperity,” “security,” “success,” and even “salvation.” My research tells me that the best English translation of shalom is “well-being,” but the shading of the word leans heavily toward wishing someone material success or worldly security. This is perhaps more like the Vulcan greeting, “Live long and prosper” than it is the Buddhist idea of “eliminating suffering by eliminating desire.” Jesus leaves us his peace, true; but, he explicitly notes that this is not the peace of the world. His peace is something else entirely. Jesus says, “Peace I leave with you; my peace I give you.” My peace. Most certainly not the World’s Material Peace or the Empire’s Political Peace or the Temple’s Religious Peace. But the Peace of Christ. What sort of peace is this? Christ’s Peace comes with the Holy Spirit. Notice the sequence of events in the gospel: Christ is leaving the disciples to go to the Father. He says he is sending the Advocate in his place to teach them everything and to remind them of all that he has taught. Being reminded of Jesus’ teachings, of everything he has said, and then remembering his teachings—this is “Christ’s Peace.” Does being reminded of Christ’s teachings and then remembering Christ’s teachings bring you that pleasantly numbed feeling that we often associate with a material “peace”? Let’s hope not! In the same way that welcoming Christ’s love into your life requires a commitment to conversion and service—“whoever loves me will keep my word”—so accepting his peace means settling your troubled heart into the truth of his teachings—“Do not let your hearts be troubled.” You are no long your own. Being heirs to Christ’s Peace, then, is first about being heirs to his teachings; being the recipients of his Word and the certainty we have in the truth of his witness. This is the peace we live knowing that Christ reveals the Father and that the Spirit dwells among us as their Love for one another. Again, there is nothing numbing or tranquil about this fundamental fact of the faith—it bears on our souls to live this truth fully in the world. We must give flesh and bone to this truth; we must incarnate Christ’s love, and in doing so, accept his peace. How? We live Christ’s triduum—in his betrayal, his humiliation, his beatings, his Cross, and his tomb—we live these as Christ himself did: trusting in God’s care, His plan, His blessings and abundance, and then giving our lives freely for others. Isn’t this is the courage of the martyrs? Their witness to the bare bones power of Christ’s promises? They took on Christ’s Peace and their question to us is clear: will you follow…if called upon, will you follow? Now, knowing that Christ’s Peace might require a Red Witness, does the thought of receiving his peace make you a little nervous? If you love him, you will keep his Word, preach his Word, teach his Word, obey his Word; you will make your dwelling with him, and follow him always; you will fall, fail, rise again and peak; you will stumble and crash and you will jump and fly; you will believe and doubt and hide and find; and you will come to a passionate obsession, a loving fascination with the movement of the Spirit, the leadership of Christ’s Peace in your life. But expect no peace of mind. Rather welcome the intellectual turmoil that follows the sword of truth. Expect no peace in your body. Rather welcome the tension that comes with making your flesh a daily sacrifice. Expect nothing balanced or harmonized or gentled to rule you. You are ruled by the Prince of Peace, the One Anointed, whose reign requires you to serve against your best instincts, to surrender your greatest perceived needs, and to follow into hell and on to heaven a dead Jewish rebel executed on a tree. How absurd! And yet, the Spirit burns, with tongues of fire, the Law of Love into our hearts: to die for a beloved friend is the greatest gift. When you exchange the peace this morning, remember: you are not wishing your neighbors worldly well-being or cheerfulness or a pleasant day/tomorrow. You are reminding them (and you are being reminded in turn) that Christ’s Peace is more threat than promise. Think: “Peace be with you” means “You are Christ. You will suffer, die, and rise again! For whom will you sacrifice yourself today?” Perhaps you will skip the exchange of peace altogether! Don’t! Why? Jesus said, “Whoever does not love me does not keep my words…” There is no dwelling place with the Father for those who do not keep Christ’s words. So, love Christ, keep his Word. And take on his Peace with fear and trembling; take it on only when you are grateful enough to him for dying for you that you are ready to die for someone else. Then, only then, you are truly at Peace. Christ’s Peace. 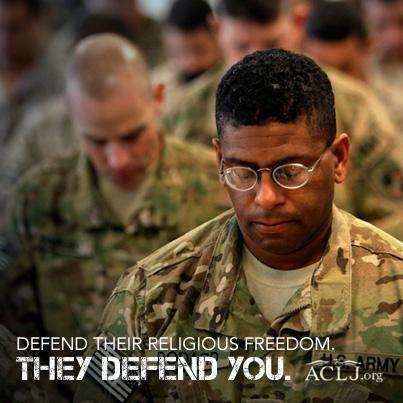 There are ominous signs the U.S. military is turning its back on religious freedom. On April 23, Pentagon leaders met with Mikey Weinstein, an anti-Christian extremist who decries “fundamentalist Christian monsters” and calls Christians “pitiable unconstitutional carpetbaggers.” He compares Christians to racists from the civil rights era. If he said these things about Muslims, he’d never be permitted in the Pentagon; but now military leaders are actually consulting with him – relying on his input – as they create new policies that may roll back religious liberty – especially for Christians. This must stop!